I remember the day clearly when I first spotted a Kitchen Aid mixer. It was 14 years ago, in my Aunt's farm kitchen. We were going to spend the day baking scones and cakes, something I wasn't particularly thrilled about because I wanted to be outside with the animals. But then she opened a cupboard and carried out the most beautiful appliance I had ever seen in my life - a KitchenAid mixer. At that moment I had my heart set on getting one of my very own. Images sourced from the Yuppie Chef website. 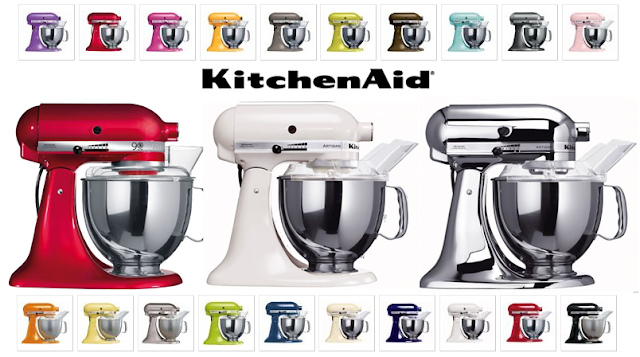 I often browse the Yuppiechef website looking at all the kitchen gadgets and tools and often find myself going to the same Kitchen Aid page just to admire the mixers that are available in so many different colours. My favourite colours are shown enlarged in the picture above (Candy Apple, White and Chrome). Ranging in price from R5990 to R8490 it will be a while before I can happily spend money on one (because I am not even a big baker) but a girl can always dream! Yuppiechef also sells Le Creuset, which I recently posted a Feel Good Friday post about and it is another brand my eyes wander over in amazement. Follow Yuppiechef on Twitter, Facebook and Shop online.